Friday night we drove down to my parents (which is half way to the beach) to sleep before we headed to Orange Beach on Saturday. So we woke up at the crack of dawn Saturday to head to meet some of Derek's jetski buddies for a day of riding. 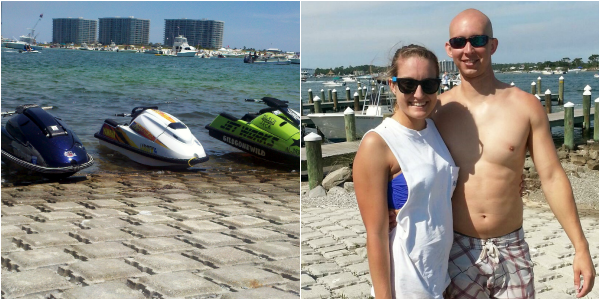 We started off at the beach, then they went to the boat ramp for a "little while" to do some riding in the bay. A little while turned into three hours of me on a beach by myself with only one bottle of water and some banana chips. 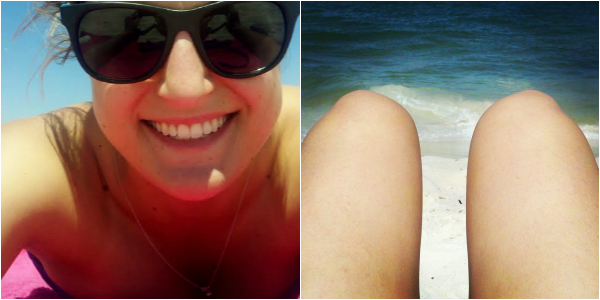 Obviously I survived the time by taking selfies, taking leg/ocean shots, and catching up on my twitter feed. Finally someone came and picked me up on a ski and took me back to the boat ramp where I was able to rehydrate and hang out with everyone. (Don't worry I wasn't really abandoned, I told them I didn't mind laying out alone). Sunday we went to church with my family, where the choir/high school JROTC put on a good little skit about Memorial Day and it's true meaning. After church, I went to my little brother's baccalaureate service. 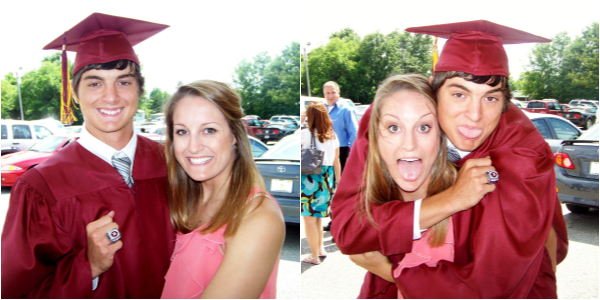 Sadly, I'm not going to be able to make it to his graduation, so this was the second best thing. I am so incredibly proud of him, he has accomplished so much this year. And we found out last week that he was offered a full-ride scholarship to play baseball (which he accepted) at a college that's less than an hour from me! I'm couldn't be more happy or excited for him. Monday I actually worked half a day then met Derek at the river. This was the first trip on the river in the "big" boat this year, which is crazy, because last year we were on it every weekend starting in April. We relaxed and cruised the river all afternoon soaking up the sun (not that I needed anymore), and even found a sunken boat. Which we contemplated towing back but thought better of it. It was the perfect wind down to an awesome weekend. I really kind wish three day weekends were an all the time thing. So envious of all the water/tanning time! 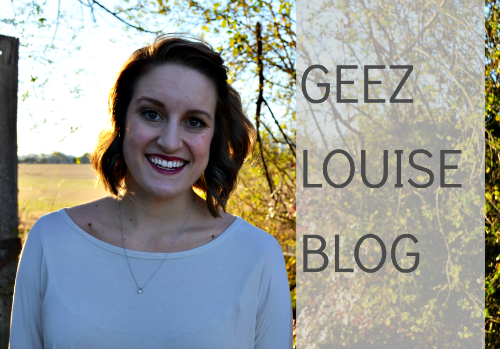 It was overcast all weekend (minus a few hours last night) here in CenTX so here's hoping the weather gets nicer here so I can take a note from you! 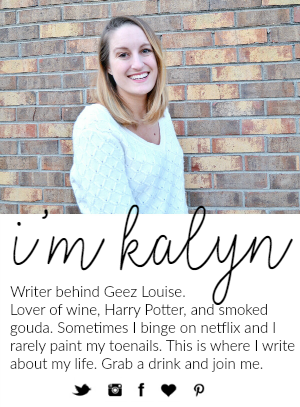 Thanks for linking up, Kalyn! I vote for a three day weekend every week. Jetskiing sounds awesome! Glad they came back to pick you up on one. I realised yesterday that most of the blogging community seems to be American, therefore the "weekend" ended today. It was a good idea to post today! 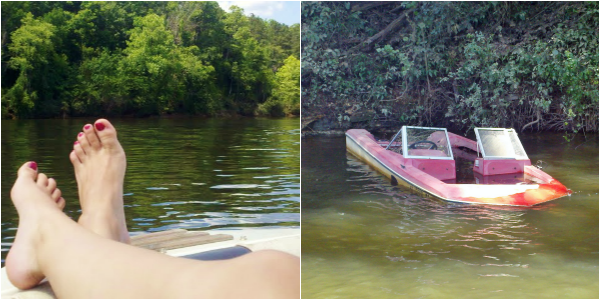 so jealous of your time at the beach & river! Congrats to your brother on the scholarship, that's amazing! I vote for 3 day weekends all the time too! Sunbathing on the beach sounds perfect right about now. Sounds like you had a great weekend! And congrats to your brother, that's huge!! loong weekends are the best! how great is it that you got three days off! thats awesome news about your brother! Look to Champs Activités sportives Habillez-vous à la Nike Shox R3 la prochaine fois que vous avez besoin de chaussure nike air presto femme vêtements de sport pour toute votre famille? enfants, femmes, hommes, athlètes sérieux et guerriers du week-end? Champs a tout pour tout le monde. Il peut être situé au sud-ouest de votre plateau de l'Acropole, idéal à proximité de la Propylaia. Bien que je voulais acheter beaucoup d'accessoires, mais mes priorités Nike Shox Monster SI certains vêtements et des baskets pour mon chéri chéri! Comme j'ai toujours l'habitude de chausser une paire de pantoufles bien que je sois à la maison et chaussures de fantaisie et élégant alors que je suis officiay habillé, donc je voulais des baskets excellentes et jolies pour mon chiot aussi. 1990 a été une excellente année pour la star, et une année encore meilleure pour lui de présenter ses toutes nouvelles chaussures de sport au grand public. Certains ophtalmologistes choisissent d'apprendre et de pratiquer la chirurgie oculaire au Texas LASIK, la neuroophtalmologie ou asics gel lyte iii kaki femme la pathologie ophtalmique. Autour des années 1950, c'est quand leur entreprise a vraiment décollé.